Uniquely Elegant Salon Spa – (beauty salon) is always endeavoring methods to provide a high standards of excellence, the most updated professional haircuts services, attentive client care, inviting interiors and premium products. Let our hair stylists and hairdressers provide you, our honored guest, with the ultimate hair salon experience. We care about your hair and beauty. Hair Salons, Spa Albuquerque, NM – Uniquely Elegant Salon Spa – beauty salon spas is always endeavoring methods to provide a high standards of excellence, the most updated professional haircuts services, attentive client care, inviting interiors and premium products. Let our hair stylists and hairdressers provide you, our honored guest, with the ultimate hair salon experience. We care about your hair and beauty. • Woman's hairstyles, haircuts, blow dry – Long hair layers, Short haircuts for women. • Men's haircuts, men's hairstyles, men's razor cuts and great clips for men. • Kids haircuts and great clips for kids. • Brazilian Blowout smoothing treatment. • Brazilian Chocolate deep conditioning treatment. • Morrocanoil (Moroccan Oil) deep conditioning treatment. Types of hair: long hair, short hair, frizzy hair, wavy hair, curly hair, course hair, ethnic hair. Alfaparf, Moroccanoil, Brazilian Blowout, Tea Tree. 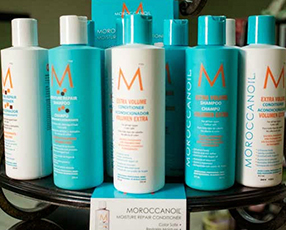 Moroccanoil is the best hair conditioning products on market today. Moroccan oil has Argan oil and is made from the actual nuts from the Argan tree, where it almost solely grows in Morocco, is known to have restoration and age-defying effects. As hair stylists, we typically advise our clients from our Albuquerque, NM hair salons, to use the professional shampoos and conditioners, as professional products, Moroccanoil, have the correct PH balance for each hair type. A selection of enzymes and masks for your skin type to target optimal skin function. Moisturizers to provide hydration leaving the skin feeling silky and smooth. Passion fruit enzymes increase blood circulation and firm the skin. It is a great antioxidant to give the skin a healthy glow. Kollaren peptide increases resiliency and elasticity in the skin by supporting dermal tissue strength. Blueberry enzymes contain powerful antioxidants with 1% glycolic and 1% salicylic acid to digest dead skin cells, soften sebum and promote deep pore cleansing. Minimize appearance of fine lines, wrinkles while reducing the appearance of puffiness and dark circles. Boost the skin natural collagen production. Creamy, gentle cleanser whips up on skin,exfoliating with sugar and apricot powder, while moisturizing with Shea butter and coconut water. Skin is polished to radiance without feeling tight. Dissolves the desmosomes that hold skin cells together to allow for efficient exfoliation. Treats mild to moderate acne, softens skin, and minimizes pore size. (30% acid) Add-on to any facial. Treats dehydrated, maturing skin, hyperpigmentation, sun damaged skin and acne. (PCA medical grade line), up to 3 layers. Softens the depth of surface lines around the eyes and nasolabial folds, help clear acne, smooth skin texture and even skin tone. (PCA medical grade line). © 2019 uniquelyelegantsalon. All rights reserved.